"A delicious (though a bit odd looking) smoothie that is dairy free and fills that chocolate-mint craving!" 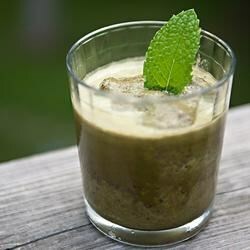 Blend coconut milk, spinach, mint leaves, cacao seeds, peppermint extract, and stevia powder in a blender. While blender is running, drop in banana chunks, one by one. Add ice cubes until smoothie has desired thickness, and water if smoothie is too thick. Nice and refreshing but I had to go out of my way to get a lot of the stuff to make it. Yummy! I omitted the mint extract and added more mint - it was still minty. Made as is and it really did taste like Thin Mints. Next time I would like to decrease the peppermint extract and also use peppermint herb not spearmint. Very good. I used low-sugar cacao powder instead of cacao seeds.